In a cell's nucleus, chromosomal DNA is tightly bound to structural proteins known as histones, an amalgam biologists call chromatin. Until about two decades ago, histones were regarded as a nuclear "sidekick," the mere packing material around which the glamorous DNA strands were wrapped. Recently, however, biologists have developed a greater appreciation for how DNA/histone interactions govern gene expression. In 2012, investigators from multiple research institutions studying the sequence of the genome from cancer patients rocked the "chromatin world" when they independently reported that mutations in the gene that encodes histone H3.3 occurred in aggressive pediatric brain tumors. This finding was stunning, as researchers had never before associated histone mutations with any disease, much less a deadly tumor. What followed was a race by cancer researchers worldwide to discover how histone mutations might promote tumorigenesis. Now a paper from a laboratory at the Stowers Institute of Medical Research reports the first animal model created to assess the molecular effects of two different histone H3.3 mutations in the fruit fly Drosophila. The study from a team led by Investigator Ali Shilatifard, Ph.D. published in the August 29, 2014 issue of Science, strongly suggests that these mutations actually could drive cancer and identifies interacting partners and pathways that could be targeted for the treatment of cancer. Molecular biologists categorize these mutations as "K-to-M", because a normal lysine residue (symbolized by K) in the protein is replaced by methionine (M) through mutations in the DNA sequence. In pediatric tumors, K-to-M mutations occurred at lysine residue 27 (K27) of histone H3.3. Researchers suggested that the presence of even a small population of these damaged proteins in the nucleus muffled a large repressor complex called PRC2. Normally, PRC2 acts as an enzyme to decorate histone lysines with one or more methyl groups, which silences gene expression by squeezing associated DNA into an impenetrable coil. "Previously scientists knew that mutations in methylating enzymes like PRC2 occur in some cancers," says Shilatifard. "What was surprising here was finding that mutation in one of the copies of the histone H3 gene, one of the proteins that PRC2 modifies, is associated with cancer. To figure out how that happened, we were interested in developing an in vivo model for the process in systems that we can study." 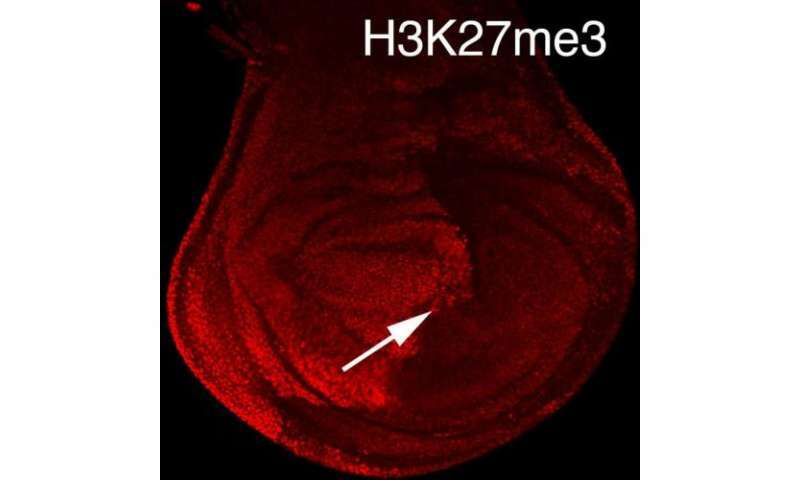 The team first engineered a version of histone H3.3 that mimicked the K27-to-M mutation and then inserted that construct into embryonic fly tissues to produce the damaged protein in a living fruit fly. Using antibodies that recognize methylated lysines, they discovered that a dose of the mutant protein was sufficient to decrease global methylation of normal histone H3.3 proteins at K27, just as loss of the PRC2 repressor would. When the group engineered a similar K-to-M mutant at lysine 9 (K9), they saw similar results. This analysis of the H3K27 and H3K9 mutants confirmed in vivo that K-to-M mutations in histone H3.3 repress a key repressor, PRC2, but did not nail down how this happened. "One question was whether a single amino acid change like this could alter the way histone H3.3 interacts with other proteins," says Marc Morgan, Ph.D., a co-first author of the paper, "The mutant could be either losing or gaining something." To determine which, the group collaborated with the Stowers Proteomics Center to compare factors binding to normal histone H3.3 versus the K-to-M mutants using mass spectrometry. That analysis revealed that the presence of mutant histones globally dampens histone interactions with some of the usual repressor suspects. But in what Morgan calls an "Aha!" moment, they detected promiscuous association of a demethylase called KDM3B with the histone H3K9 mutant. "This suggests that these mutations inappropriately pull a demethylating enzyme onto chromatin, which then erases methylation marks in histones around it," Morgan says. Loss of methylation marks could allow expression of nearby genes. To confirm this, the group employed a Drosophila staining trick that allows experimenters to visualize how repressed genes are affected in entire tissues. The expression of KDM3B demethylase derepressed the gene expression in tissues such as salivary glands, just like the expression of the H3K9 mutant. This supports the idea that K-to-M mutations recruit a demethylase (like KDM3B) to demethylate chromatin on the K9 residue of H3.3 proteins in the neighborhood, where it likely uncoils chromatin to allow activation of genes that should be silenced. This outcome could cause cancer in numerous ways. "One possibility might be that oncogenes that are usually silenced by methylation of residue 9 might be derepressed in the presence of the mutation," says Hans-Martin Herz, Ph.D., a co-first author of the paper. But Herz is cautious in interpreting these findings, simply because, unlike the K27 mutations, mutations at residue K9 are not yet reported to be associated with cancer. Intriguingly, other researchers recently reported a different K-to-M mutation (at residue 36 of histone H3.3) in chondroblastoma, a bone cancer sub-type. Why K-to-M mutations are so specific to a particular cancer is unknown, but Shilatifard says there can be little doubt that they play a central rather than a bystander role in tumorigenesis. "Uncharacterized K-to-M mutations may occur in other cancers," he says. "Our work allows us to identify the molecular players involved in chromatin signaling in Drosophila and then apply those findings to human cells."